Note: The information on this page is not a substitute for professional medical advice. Please consult with your doctor before taking any new dietary supplement, including A2X. A2X is a dietary supplement whose individual ingredients have a long-standing reputation of safety and effectiveness. A2X can be taken with most prescription and over-the-counter medications. 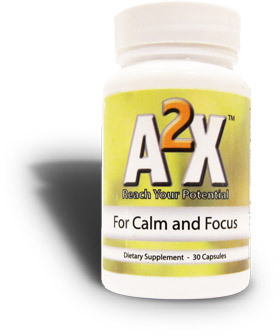 When taken as directed, A2X is safe and poses no short-term or long-term health risks. When taken as directed, A2X is not addictive or habit-forming. If you wish to stop taking A2X after taking the supplement daily for more than one month, we recommend that you gradually taper down your dose over 7-21 days. Although abrupt discontinuation is not unsafe, discontinuing gradually may reduce the likelihood of stress-related symptoms returning. Pregnant and nursing women should not take A2X (or any natural supplement) without the approval of a physician. Do not exceed the recommended dose of three capsules at once or six capsules daily. Exceeding the maximum dose is not unsafe, although it may result in drowsiness or discomfort. Before taking A2X, talk your doctor if you are taking seizure medications, pain medications, muscle relaxants, other sleep or anxiety medications, or other medications that may cause drowsiness. A2X may increase the sedative effects of these drugs. Do not take A2X if you are currently taking an MAOI or have taken an MAOI within the past two weeks. In general, A2X can be safely taken with prescription sedatives, including benzodiazepines such as Xanax® (alprazolam), Valium® (diazepam), and Ativan® (lorazepam). Keep in mind that A2X may increase the effects of sedative medications, although this interaction is not unsafe at recommended doses. If you are taking any type of sedative medication, use caution when driving or operating heavy machinery until you're familiar with the effects of A2X. If you are currently taking prescription medication, we advise that you talk to your doctor before taking A2X or any new supplement. In general, A2X can be safely combined with prescription SSRI antidepressants, including Celexa® (citalopram), Lexapro® (escitalopram), Luvox® (fluvoxamine), Paxil® (paroxetine), Prozac® (fluoxetine), and Zoloft® (sertraline), as well as non-SSRI reuptake inhibitors such as Effexor® (venlafaxine) and Wellbutrin® (bupropion). A2X should not be combined with MAO inhibitors. If you are currently taking prescription medication, we advise that you talk to your doctor before taking A2X or any new supplement. A2X will not reduce the effectiveness of birth control or interact with contraceptive medication. However, we advise that you talk to your doctor before taking A2X or any new supplement. Do not consume alcohol until you are familiar with the effects of A2X. In general, consumption of moderate amounts of alcohol is safe while taking A2X. However, we advise that you talk to your doctor before taking A2X or any new supplement. A2X may increase the sedative effects of alcohol, so avoid drinking large quantities of alcohol while taking A2X. In general, it is safe to take A2X if you are also taking other vitamins or nutritional supplements. Of course, we always recommend talking with your doctor before taking any new supplements.